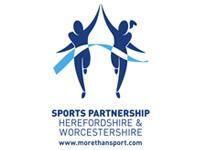 Welcome to the Sports Partnership Herefordshire & Worcestershire. The Sports Partnership is one of six County Sports Partnerships across the West Midlands working to increase particpation on sport and physical activity and locally we are an alliance of the eight Local Authorities and two Primary Care Trusts (PCTs) of Herefordshire and Worcestershire, University of Worcester, Sport England and National Governing Bodies of Sport (NGBs). At the Sports Partnership we are dedicated to encouraging local communities to get involved in Community Games and bring the spirit on London 2012 to their own doorstep.